For many college students, surviving on four hours of sleep and a pot of coffee becomes all too familiar. Students begin to place their health and well being on hold, while adjusting their main focus to tests and assignment deadlines. Aside from academic schedules, limited finances can also put a lot of stress on a student’s life, leading to unhealthy eating habits. Foods that are generally considered healthier and labeled as “organic” can be higher in price compared to the cheaper processed snacks. Exercise Physiologist Alexandra Brown identifies hectic schedules and bad habits as some of the main problems in a student’s health. Brown explains that a majority of “ready-to-eat” snacks that students frequently turn to are high in sugars, salts and saturated fats. In order to fulfill a healthy lifestyle, students need to learn how to manage their schedule allowing them to focus on eating habits and fitness. Customizing your own meal plan into something that works for your academic schedule is an amazing way to get your body back on track. Skipping a meal becomes super easy when trying to finish a homework assignment, but that can lead to overeating and unnecessary snacking later on. To avoid this, establish a time for breakfast, lunch, dinner and the casual snack here and there. Say no to the salty bag of chips staring at you through the vending machine and be prepared for your study break snack by pre-planning your munchies. Brown recommends looking for items with a long shelf life that can save you money and last a long time in dorm rooms. “Aside from trail mix…multigrain crackers, dried fruit and rice cakes are all easy and long lasting snacks to have,” Brown said. Rochester College senior Jenna Orr, biology major, agrees with Brown’s recommendation for meal planning and implements her own routine for class every semester. Not only are sugary drinks bad for you, but they also burn a hole in your wallet. Believe it or not, switching to just drinking water can save you hundreds of dollars. The Simple Dollar’s financial blogger Trent Hamm did a study and found that choosing to drink water instead of purchasing soda could save you about $312 every year. Health authorities say that our bodies need about eight glasses of water a day, so drink up! 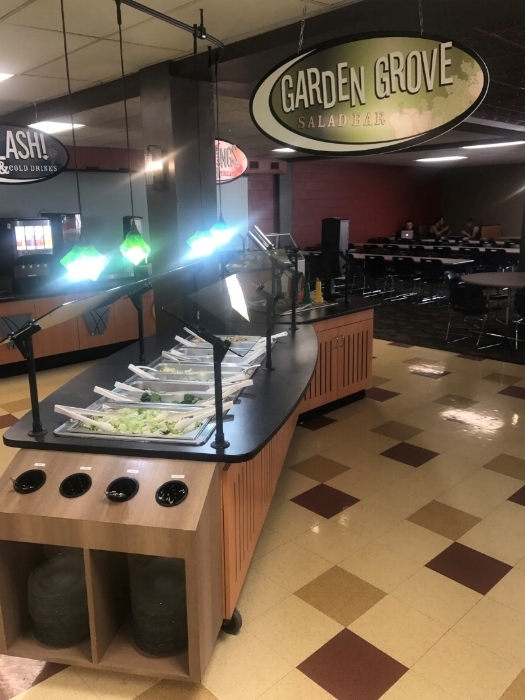 Put your new eating habits to practice by hitting up the salad bar as substitution for some of the unhealthier options provided for dinner. Yes the pizza and French fries will be calling your name, but your body will thank you later after fueling up on some dense greens. And who says salads have to be boring? Add different toppings like broccoli, green peppers and grilled chicken to spice it up. Just keep an eye out for those high calorie dressings! Brown suggests students should create a support system on campus to help each other get motivated. “Getting a friend involved in fitness is really helpful. Having someone to share the experience with has shown to have a positive effect on staying active,” Brown said. Going cold turkey on all your favorite treats is going to be extremely hard and can often lead to the dreadful binge eating. Allowing yourself to have your beloved snacks in moderation will keep you on track for the rest of the semester and hopefully curb any crazy cravings. Find out the calorie count of your favorite fast food restaurant at Calorieking.com.